From beginners to serious amateur Astronomers, the modern tools available are certainly becoming more and more capable and complex. But there’s such a collection of brands and products that picking the right telescope can be quite overwhelming. In this buying guide, we are going to focus on the best computerized telescopes. What is a Computerized Telescope? A computerized telescope is a traditional telescope paired with a computer and a GPS system that allows to track objects without the need for a star navigation map or tracking celestial objects manually. There are two types of computerized telescopes: Motorized and non-Motorized. When we talk about motorized computerized telescopes we are referring to the telescopes that use a mounting system called GoTo mount. These mounts typically are fork driven with a double fork drive or a single fork drive and they can be equatorial as well. Now, these GoTo mounts have electronic devices, electronic motors for both axes and they are connected to a computer and a GPS system. This will allow us to automatically track diverse objects in the sky leaving all the manual work aside. On the other hand, non-motorized computerized telescopes will also provide a computer with all the data but you have to manually track an point the optics with the computer’s instructions. Please keep in mind that in this buying guide we will focus on motorized telescopes. Although is an extra cost the benefits of the motorized options are far more interesting. Why Choose a Computerized Telescope? Why Shouldn’t You Choose A Computerized Telscope? What Makes a Good Computerized Telescope? The first and most clear advantage is that a computerized Telescopes with a GoTo mount and a GPS system will automatically track the diverse objects in the sky for you. This feature is really helpful for beginner Astronomers that are overwhelmed and don’t know how to manually track the night sky objects, to advance users that can enjoy a quick and easy to use system with a complete data-base to track from the Messier Catalogue to deep sky objects with just a click of a button. It’s important to note that the provided computers are user-friendly and really easy to operate. Yo don’t need to have technical knowledge to be able to enjoy this motorized telescopes. In most cases, this telescopes will also provide a useful guided tour to discover the night sky. Finally, these systems are ideal if you are in a light-polluted scenario because they use their built-in GPS to track objects while navigating with a star map on your own with a bad light condition can be a real challenge. Why shouldn’t you choose a Computerized Telescope? All the benefits that we talked about come with a cost that adds up to the foundation of a traditional telescope. So if you are on a budget you will need to decide if you go for a computerized system with smaller aperture optics or go for a manual system with larger ones. Keep in mind the size of the Telescope will impact on the performance (not the magnification). Also if you consider yourself not too friendly with technology, (although the computers are relatively easy to operate) you will have a hard time using your brand new telescope. So maybe going the traditional way is a safer bet. What Makes a Good Computerized or GoTo Telescope? We need to understand that a computerized telescope is a traditional telescope with interesting gadgets added to it, so the main factors that make a good telescope will also apply here. The quality of your next telescope will be determined by its aperture rather than its magnification. The larger the aperture the crisper and the higher definition image you’ll get. Be sure to pay attention to the focal length this will make your angle of view wider or more narrow. Next is the mount, an essential piece of the kit. If you get the most expensive telescope with a great aperture it will be useless without a sturdy base that can keep a stabilized image. As we mentioned before in this guide we will focus on Telescopes with a GoTo mount that are motorized mounts and using the GPS system it will track all the collection of objects available on each provided computer. Keep in mind that most of the more powerful telescopes with wide apertures are normally big and heavy. So you have to decide which is the sweet spot for you. Using a quality telescope to navigate the night sky is a great experience but it also should be compact and light enough to want to use it constantly. The most important factors to look in the provided computer are the length of the database for celestial objects and if it’s user-friendly, making it easy and fun to operate. 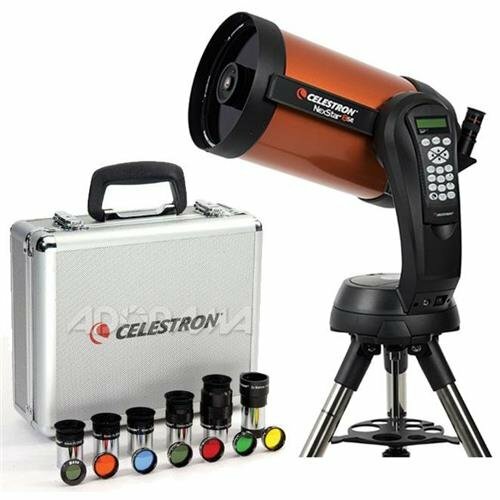 We are starting this list with a beast made by Celestron, one of the most reputable telescope brands. This beautiful Telescope if for those seeking for top-notch optical quality and the ultimate Astronomy experience but don’t need to worry about a budget. It’s also a great option for those into Astrophotography when you pair it with the HD pro accessory. This telescope was designed with deep sky Astrophotography in mind, the motors can track accurately for long exposures. That is why it is also our pick in our best telescopes for astrophotography guide. With a generous aperture of 280mm or 11 inches (improved with the Edge HD upgrade), this scope gathers a lot of light, making it ideal for nebulas and galaxies. The CPC Deluxe 1100 provides a 2800mm focal length or F/10. This long focal length lets you get really detailed views of the bright objects of our Solar System. Without the need for complex Eyepieces. This telescope comes with a heavy-duty stainless steel tripod with a motorized dual arm fork. The kind of tripod and mount you would expect for such a heavy telescope. Once everything is set up you have a nice and sturdy base that can handle all that weight without a problem. The scope features Skyline technology for a quick alignment and the provided computer comes with a database with over 40000 celestial objects and generates a list of all the best objects currently visible. The hand controller is really easy to operate. Maybe the Achilles heel of this Scope. This is a big tool that weights 30KG. Of course, it’s ergonomically designed to be able to handle it by only one person but if you are looking for something easier to travel with this is not your choice. 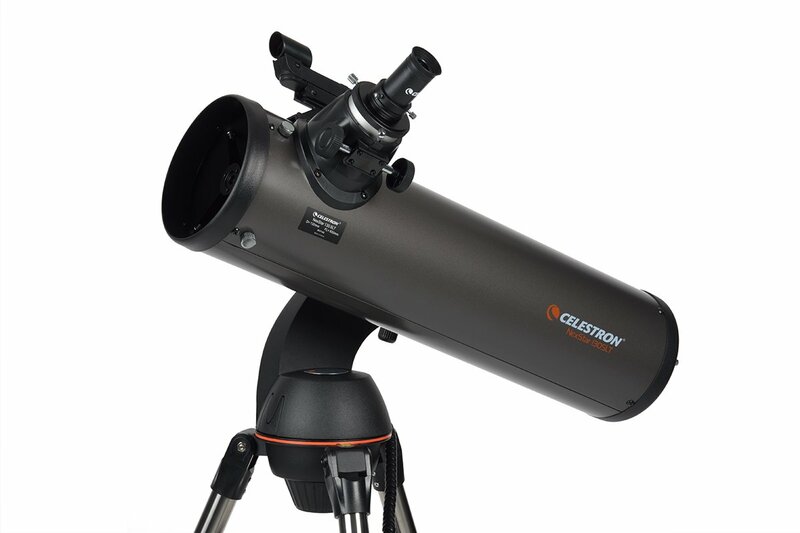 The Celestron CPC Deluxe is also available with apertures of 9.25” and 8” inches. Bringing the costs and weights down while maintaining the core features. 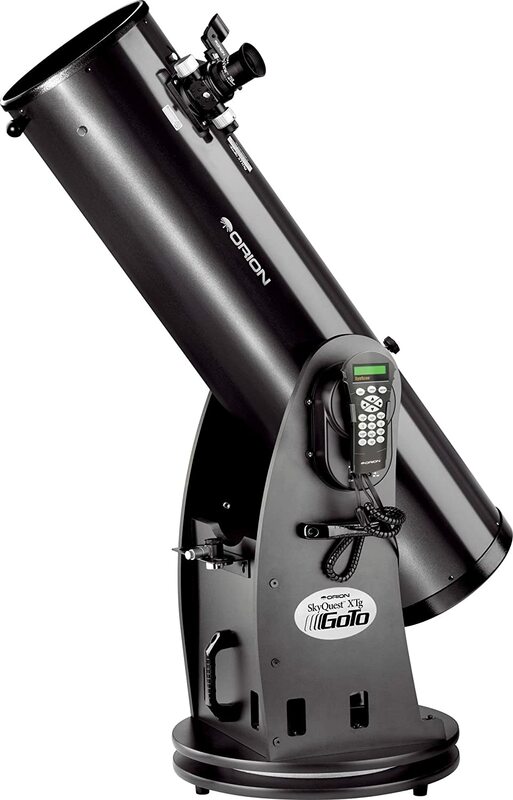 Following right behind the CPC Deluxe 1100 we have the S11830 14″ GoTo Collapsible Dobsonian Telescope from SkyWatcher. This incredible scope features a massive 14” inch aperture and they definitely thought the design out. You are able to collapse the scope making easier to transport and manage. If you take into consideration the size of the aperture this is a pretty portable option for a scope of this characteristics. Another great quality is the really easy alignment set up. That lets you track objects in no time. With a whopping 14” inch aperture this scope gathers a lot of light. Making it ideal for detailed observations of the Moon and planets but also capable of reaching deep sky subjects. 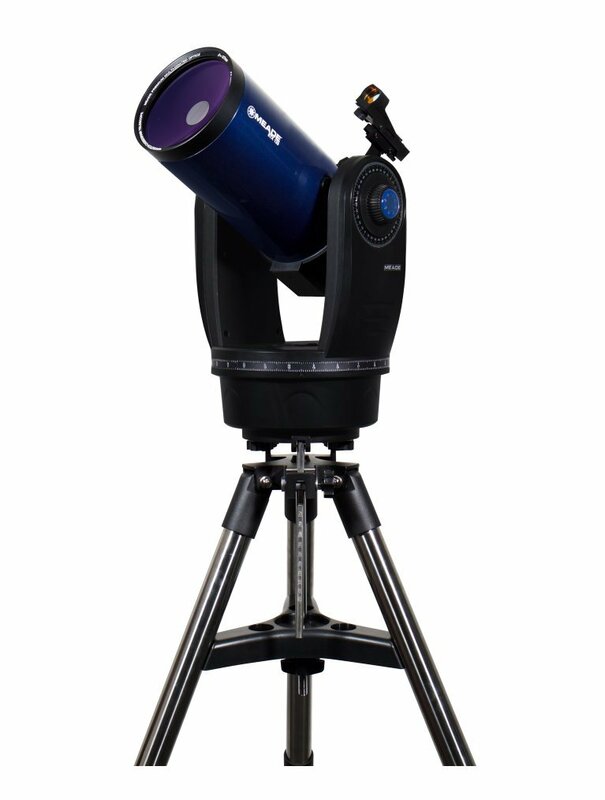 The Sky-Watcher Collapsible Dobsonian provides a 1650mm Focal Length or F/4.9 Focal Ratio. This is a GoTo mount with DC Servo Motors. It comes with a dual encoder design that lets you manually move the scope without the need to re-align. So you can decide to use it manually or track automatically with ease. With SyncScan technology the Sky-Watcher offers an easy to use computer with 42900 celestial objects to track at the push of a button. Really convenient to take advantage of the spectacular aperture and it can also provide a guided tour. Once again this is a big telescope but with the clever Collapsible OTA Design, it makes it decent to travel with. You can separate the base if you travelling in a car or you can just collapse it if you travel in a SUV. Now is Orion’s time. As we go down the list we are picking more affordable options that are more budget friendly. The Orion 10135 SkyQuest it’s great scope in the mid-range budget. This Fully motorized GoTo Dobsonian reflector telescope comes with a couple of accessories, an easy finder tube helping you with the two-star alignment and two eyepieces (28mm 2″ DeepView eyepiece, 12.5mm 1.25″ illuminated crosshair Plossl eyepiece). With a good aperture of 10”inches what is really good for its price point, is capable of capturing the Orion Nebula and the Andromeda Galaxy. A Fully Motorized Dobsonian mount equipped with optical encoders and drive motors on both the altitude and the azimuth axes. The computer is an illuminated push-button hand controller that allows you to select one of the 42,000 objects from a number of intuitive menus. Contrary to the SkyWatcher Sl 1830 this Dobsonian Telescope doesn’t collapse. Making it an inconvenient choice for travelling. 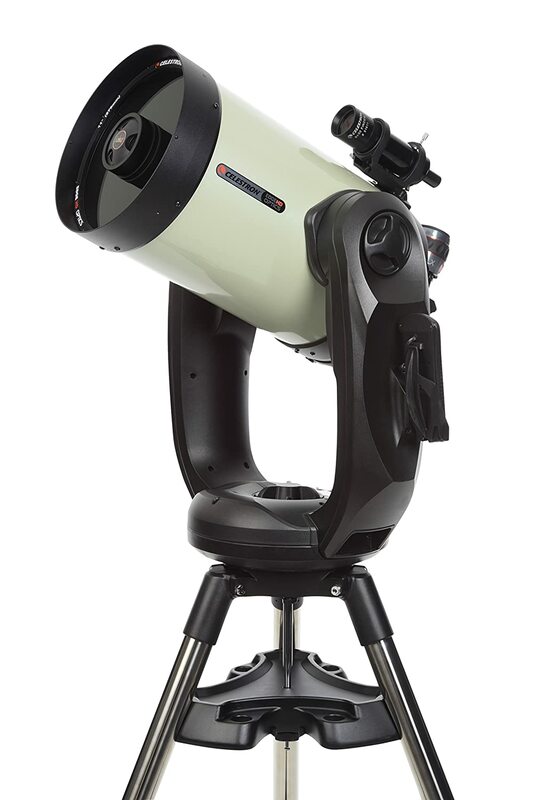 The NextStar 8 SE is a Schmidt-Cassegrain Telescope, a classic first introduced in the 1970’s and now updated with modern features like Star SkyAlign just like the CPC Deluxe11000 a great technology by Celestron. This scope was designed with ease of use in mind and this particular kit comes with a set of very convenient eyepieces. A well-rounded instrument good for beginners to advanced users and well suited for Astrophotography. The aperture is 8” inches a good dimension that gathers a lot of light. This is the largest aperture in this series, letting you see deeper into space. The NexStar 8SE comes with a 2032mm Focal Length, a f/10 Focal Ratio. This GoTo Mount is a single fork arm with dual servo motors. Its precision tracking makes it a good choice for shorter-exposure Astrophotography. The brain of the scope is the iconic NexStar+ hand-controlled computer. With a database of 40000+ celestial objects, you can track everything you need. This scope is a perfect combination of a powerful tool yet portable enough to use it constantly. The ETX125 from Meade Instruments it’s a great option if you are starting your astronomy journey. The AudioStarcontroller computer features not only a celestial object data-base but 4 hours of audio content for educational purposes. 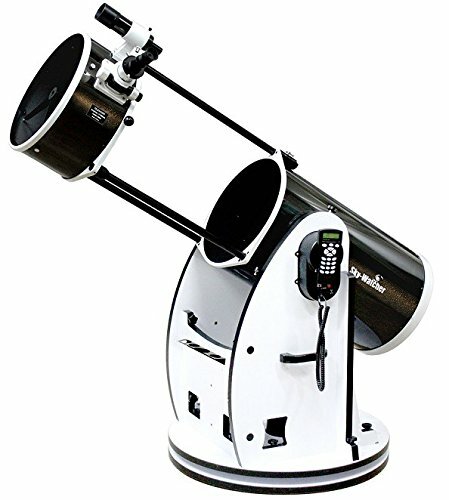 This popular scope has been refreshed with the latest technology and is the best computerized telescope for mobile astronomy. The design makes it extremely portable and easy to set up. If you want to take your scope while travelling this instrument is ideal for you. With 5” inch aperture, you can expect close up views of the moon and planets or go for stunning views of star clusters and nebulae. But you will definitely be more limited regarding what the more advanced scopes can offer. The ETX125 comes with a 1900mm Focal Length, f/15 Focal Ratio. Great Dual-fork arm with motorized Alt-Az GoTo Mount. Comes with a sturdy Stainless Steel Tripod. The AudioStarcontroller is a great starter computer with 4 hours of audio for education purposes. It has a 30000 celestial object data-base and is really easy to operate. Of course being a smaller scope the advantage of portability is clear. But Meade excelled with the design making also really easy to set up. This is by far our choice if you plan to travel a lot with your scope. Wrapping thing up we picked the best computerized telescope for beginner Astronomers. A combination of price and ease of use makes it a really interesting choice for those just starting out. This scope has an aperture of 5” inches so you can expect to see some deep sky objects and it’s more than capable for Moon and planet observations. The Nexstar 130SLT comes with a 650mm Focal Length, f/5 Focal Ratio. It has a single-arm form motorized GoTo mount with a sturdy enough tripod for a scope of this size. Just like the Meade is really ETX125 is really easy to set up. The NexStar hand controller computer is packed with a smaller 4000 Celestial Objects data-base with expanded information for 100 of those objects. It features a guided tour mode that is great for beginners. Again this is one of the smaller scopes of the list so the limitation regarding gathering light you’ll gain it with a more portable and lightweight tool. Please bear in mind that you will need to properly align the GoTo mount with at least two bright objects in the night sky. So even if this is an automatic system you do have to know the names or two or three bright stars in the sky to help you get a point of reference. For instance when you first turn on the telescope it’s going to do a little dance, it’s going to find north, it’s going to find level and based on the information it gets from the GPS it knows where it’s at on the planet and it is going to pick out a star that it wants us to fine-tune it to. For this, the computer will ask us to center that star in the Eyepiece, that’s when we use the finder scope to manually align the bright star. While most computerized telescopes need a two-star alignment some systems will require a third one. In this buying guide, we focused on computerized telescopes with a GoTo (motorized) mount. This will automatically track all the objects they have on their computer data-base. But keep in mind that there are also computerized telescopes with non-motorized mounts, these options won’t automatically track objects for you. Hopefully, at this point, you should have a better understanding of what is a computerized telescope, what makes a good one and why is a very interesting system to enjoy Astronomy and discover the night Sky. There’s definitely a lot of options in today’s market but our picks for the best computerized telescopes cover choices aimed from beginners to advanced users. We hope you found this buying helpful and please don’t forget to check our guides for the best home telescopes and top rated telescope brands.